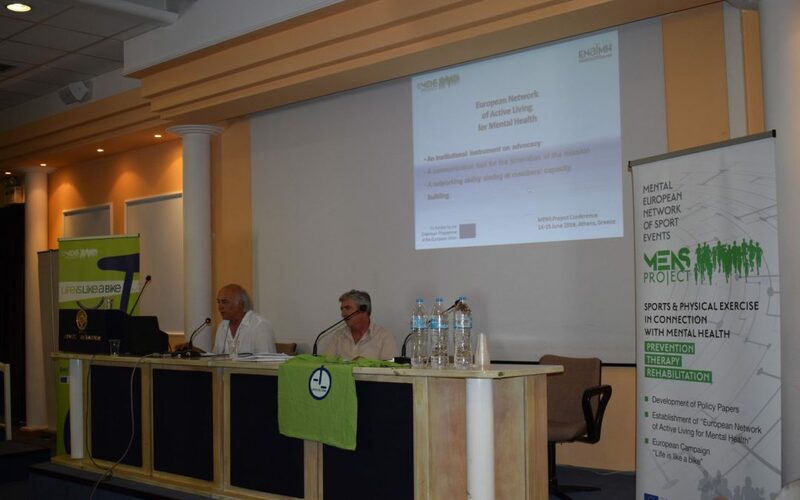 On June 14th, the final MENS Project European Conference took place at the Cultural Center of the City of Athens, where all the initiatives and actions developed within the projects implementation (January 2017 – June 2018) were presented. The MENS Project, is co-funded by the European Commission’s “ERASMUS +” program and is coordinated by the non-profit organization KSDEO “EDRA” . The proceedings of the conference began with the greetings of the President of KSDEO “EDRA”, Ms. Maria Kerasoglou, and the Secretary General of the Municipality of Galatsi, Dr. Evangelos Kyriazopoulos. Significantly, they both highlighted the value of this initiative, mentioning in their speech the ancient saying “healthy mind in a healthy body”, emphasizing in the most persistent way the value of active living to the participants – among them, the representatives of the organizations “Society of Social Psychiatry and Mental Health”, “Society of Psychosocial Research and Intervention” and “ANIMA AMKE”. The attendance of the representatives of the General Secretariat of Sports in Greece, Ms. Eleftheria Axioti and Maria Papakonstantinou was a special honor. It is quite noteworthy that the Secretary General of Sport, Mr. Ioulios Sunadinos, has offered his auspices for the 1st Athletic Organization for Mental Health – a key action of the European project EVENTS project, coordinator of which is the organization KSDEO “EDRA”. the survey, which ran from October to January of 2017 and was realized by 2.656 participants from 12 European countries, along with interviews of representatives from different organizations that influence policy makers. Its results, through structured questionnaires for recipients of mental health services, sports and mental health professionals, and general public, have captured the experience and the prevailing perceptions about the contribution of physical exercise and sport on mental health. the European awareness campaign “Life is Like a bike”, which was based on the results of the above European survey and is both informative, but also has a motivating aspect, offering a strong confirmation to those who have adopted an active daily routine, valid information to those who have not yet followed it, but also further strengthening of the existing initiatives. the policy background to link the two fields through 12 policy papers by the project partners: University of Kent (UK), Fundacion Intras (ES), COOS Marche (IT), FOKUS-PRAGUE (CZ), FIRST FORTNIGHT (IE), Merseyside Expanding Horizons (UK), Villa Montesca (IT), Rijeka Disability Sports Association (CR), Golbasi Sporium Spor Kulübü in Dernegi (TR), Ozara (SI), ASOK ), “EDRA” (GR), the Municipality of Galatsi (GR) and School of Physical Education and Sport Science National and Kapodistrian University of Athens (GR). The volume I which was included in the Conference materials contains, in addition to the text-positions, extensive bibliographical references and current policies and practices at European level. The MENS Project has laid the foundations for a European movement that promotes active living and introduces it as a means of preventing and dealing with mental disorders, delivering an already fertile ground to the EVENTS Project, the ENALMH European Network and to a series of new initiatives, the implementation of which is foreseen in the near future.